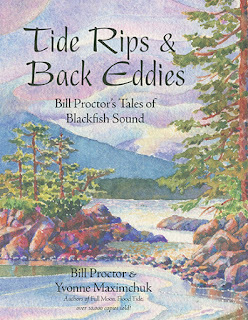 Tide Rips and Back Eddies: Bill Proctor’s Tales of Blackfish Sound (Harbour Publishing, 2015) is the second book Bill Proctor and Yvonne Maximchuck have co-authored about Billy’s life in and around the Broughton Archipelago between northern Vancouver Island and British Columbia’s remote coastal mainland. Following in the footsteps of Full Moon, Flood Tide, this book is full of the many stories about renowned Billy Proctor. In each book, I was amazed at his detailed memory of names, dates, and events. 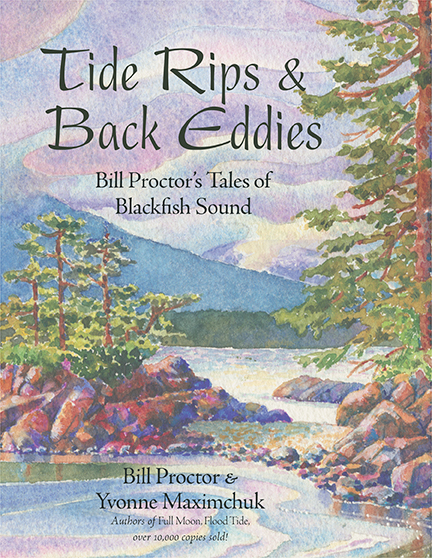 Tide Rips and Back Eddies begins with Billy’s early life growing up to a young man in Freshwater Bay on Swanson Island. 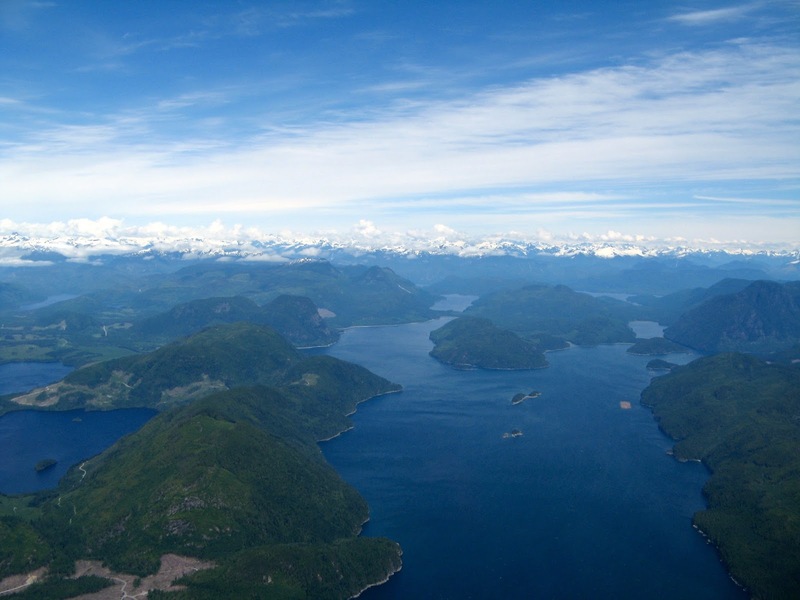 Here he learned to love nature, fish, and make a living from the abundant resources on the land and in the sea. Key points are highlighted with photographs and drawings by Yvonne. 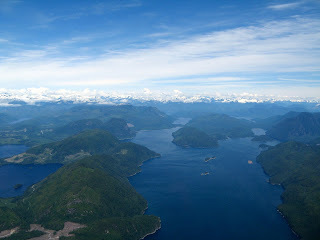 Leaving Alert Bay on Cormorant Island by air. Billy was an amazing commercial fisherman. There are stories of his many boats, fishing expeditions, his marine ways for boat repairs, and many of his old time compatriots. 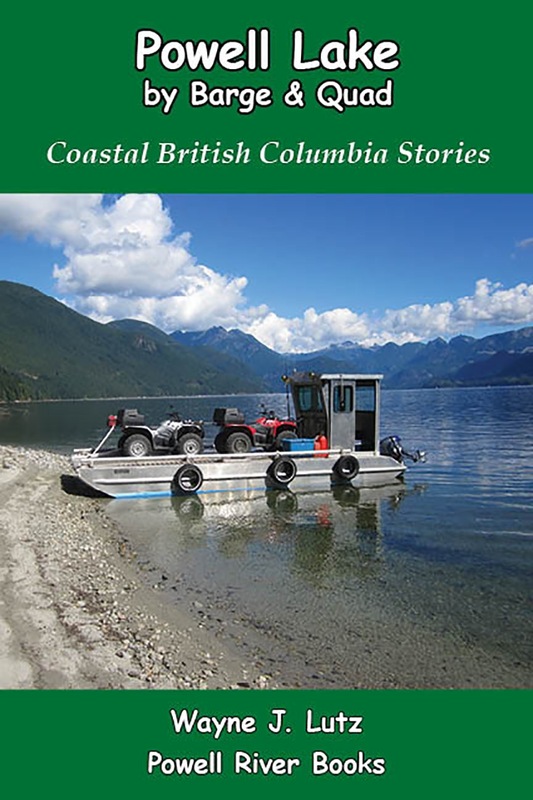 In between the stories are lots of great fishing tips, especially for salmon. 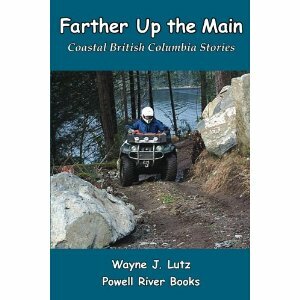 The parts of the book I enjoyed the most were about life on the coast over the years. Billy told about his mother’s home. Like many along the coast, many of the years were spent in a float home. That’s something I can relate to. 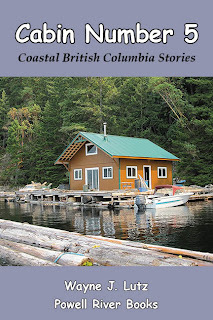 Chapters I really enjoyed were about living in Echo Bay on Gilford Island, his collections, museum and the buildings he has reconstructed from the past. 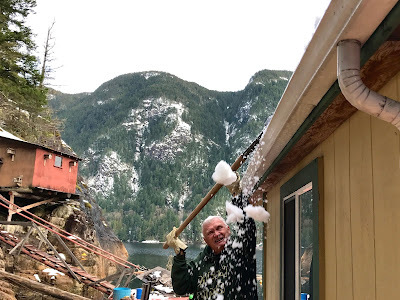 The detailed description of how to build a hand loggers shack was especially interesting. 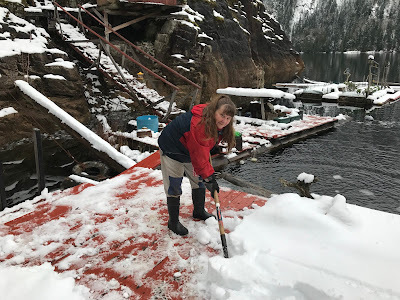 Artist, Author Yvonne Maximchuk at our float cabin. I feel like I know Billy from reading both of his books. I felt the same way about Yvonne Maximchuck from reading her memoir Drawn to Sea, but it didn’t stop there. Yvonne came to visit me at our float cabin home on Powell Lake. We felt an immediate connection. 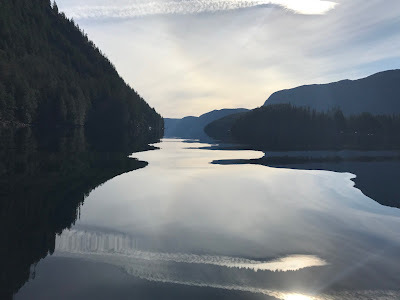 Maybe someday Wayne and I will get brave enough to tackle Johnstone Strait and make it to Echo Bay to see Yvonne and her home/studio, meet Billy, and visit his museum filled with Coastal BC history and evidence of a life well lived. After an extended period of snow and rain, it's a welcome break to have sunshine and puffy clouds. We took advantage of the good weather to take our sailboat Ste Marie out for a spin. 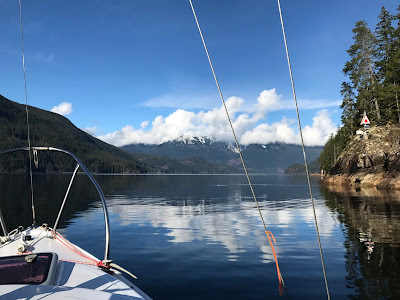 Rounding Elvis Point in calm conditions. Too calm to sail, but a beautiful reflection to the north. A few wavy wakes and the glassy water captured a solar halo. I live off the off the grid most of the year. My husband and I grew up during the back-to-the-land movement in the 60s, but neither of us participated. I guess we just weren't ready, but now we are. 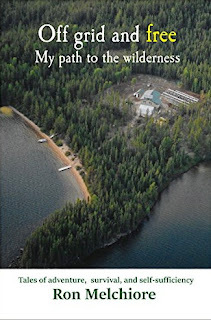 David Cox the author of Our Life Off the Grid recommended another book on his blog. It was Off the Grid and Free (Moon Willow Press, 2016) by Ron Melchiore. Ron moved off the grid much earlier in life than we did. He began by purchasing a 120 acre woodlot in Maine where he built his first off the grid home. The cabin was compact with few amenities, but it was cozy and comfortable even after he met and married his wife Johanna. It was informative to read about how they created a self-sufficient home with wood for heat, solar for power, and a well for water. The last half of the book was the best part for me. 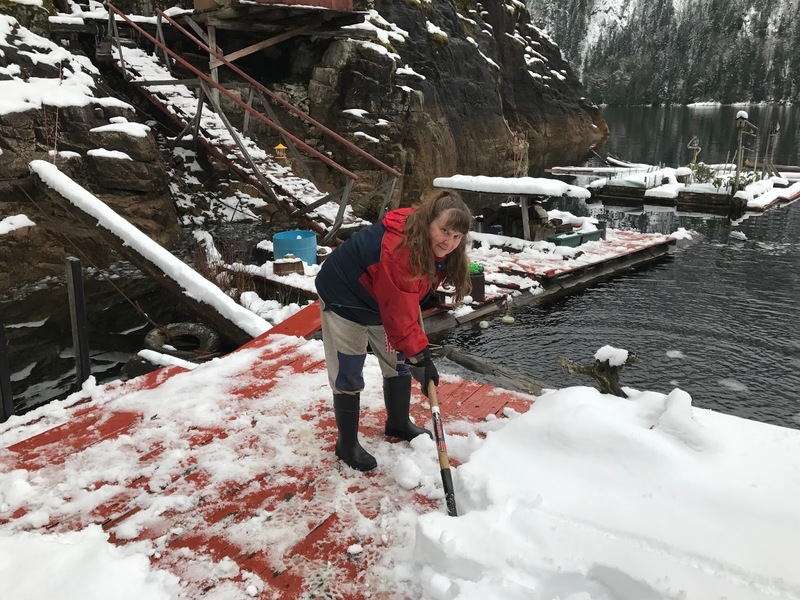 Ron and Johanna found a remote site on the shore Hockley Lake in northern Saskatchewan to build their homestead. Being 100 air miles from the nearest town was a huge challenge. So was obtaining a land lease from the government. Using their many skills and talents, they created an amazing wilderness home. 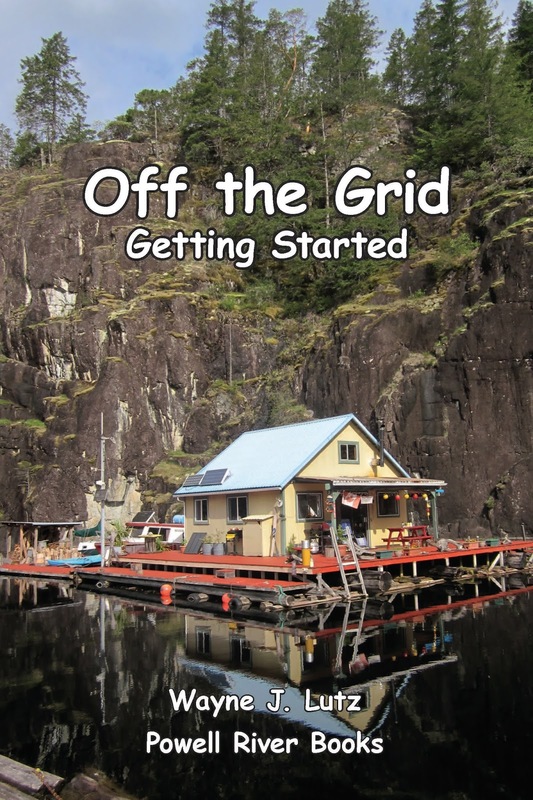 I highly recommend Off Grid and Free. You'll be amazed what this daring couple did and continue to do. You can learn a lot more about Ron and Johanna Melchiore's life on the Internet. When you get a sunny day in winter, the outdoors calls, real loud. Wayne went out to the barge and got our quads ready for a winter ride. Chippewa Bay is good winter destination because it gets direct rays until the sun sets behind the Bunster Range at about 4:00. Back at home in Hole in the Wall direct sun ends at 12:30 this time of year. Winter sun and exercise are a welcome combination. Rest break in the turnout next to a slash pile. It takes about half an hour to get from the cabin over to Chippewa Bay. Since it was a week day, we called Western Forest Products to make sure we wouldn't interfere with any logging activities. The low lake level and calm day made the barge ramp easy to use. We started up Chippewa Main heading for snow country. The lower road was clear and well maintained. Logging here has been quiet for several years, but that's about to change. Powell Lake and the high country in the backgrount. After following Powell Lake for some distance, we headed uphill towards Heather Main. It didn't take long for us to see patches of snow, and suddenly the road was covered in a thick coating of the white stuff. Like some of the people here in Powell River, we don't have tracks to turn our quads into snowmobiles. We make it to the snow level. After a break to enjoy sunshine and a winter wonderland, we headed back down to Chippewa Main. Heading north we passed the brushing machine where it stopped clearing alders from the roadbed. Ready to start back down after a fun day up in the snow. We bumped into a Western Forest Products crew surveying for replacement culverts under the road so the brusher could safely continue and the road would be ready for logging trucks.